The Three Keys; Melchoir, Balthazar, and Gasper. I was asked to do two more key paintings by my friend and long time follower Pattie. She’s been watching me grow from afar for around six years now and she was supportive from the start. 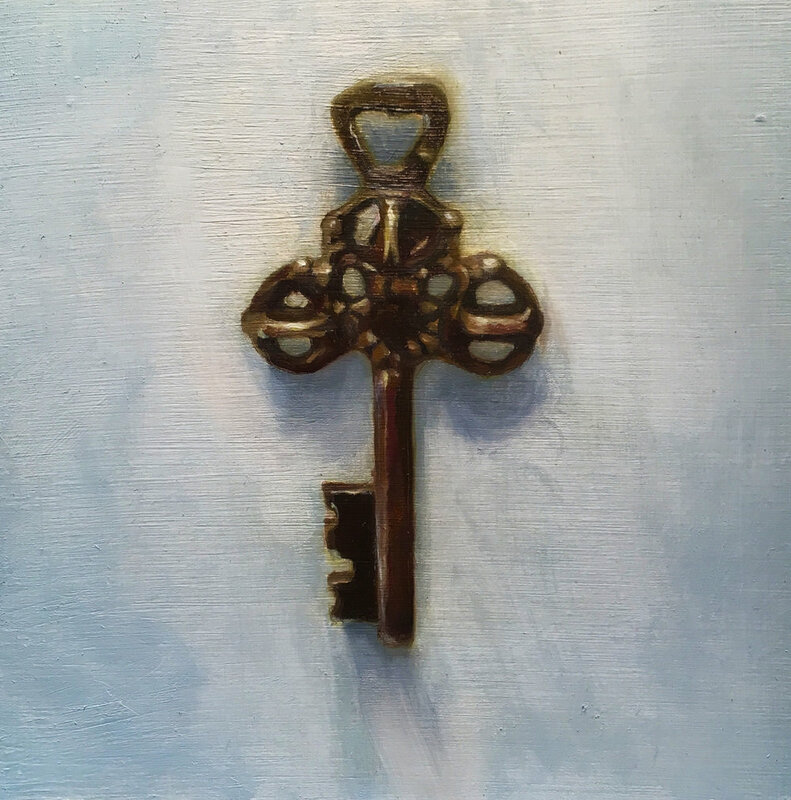 I loved the idea of getting to do more of them because they were fun to paint and then I realized that three keys sounds like Three Kings. I like this bit of serendipity. Especially since they look like crowns. It only just hit me today when I met Robbie to drop off his painting “Go For Stroh”. I told him how I had this commission and the connection I made, mentioned my grandfathers name. He said ‘That’s what you should name them’. Duh. How did I not think of that? So for me, that is what their names will be. My incredibly sweet grandfather’s name was Balthazar Nazario. (note the double ‘azar’, I just did) and that will be the first most substantial key (shown in the middle). The second red one will be Gasper and this is Melchoir. Thank you Pattie. Sometimes you just need a task to keep you on track and sometimes that task becomes something wonderful. I had been ill and quite out of commission the past few days. Was in bed all day Sunday. Tried to paint and failed miserably at daffodils. I realize it was because I was under the weather but also I think a bit burned out. Thanks to everyone that really rallied and gave me a boost when I needed it. I’m back guys with the Ides of March and I’m gonna see this thing through. I mean, it’s just getting interesting. The weather’s getting warmer and I’m headed outdoors soon with my portable easel (that I’m told is on it’s way!!). I’m pretty excited about it! Cheers, you guys! :) Welcome to week eleven.